Have you seen a Kiwiberry before??? 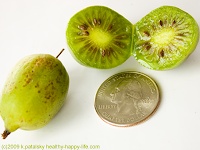 Sold right along side the raspberries, strawberries and blueberries at my local Whole Foods Market, I found this delightful tiny fruit: the kiwiberry! Kiwiberries are a cousin of the kiwi, but they are fuzz free. However, inside, these grape-sized gems is the appearance of a traditional kiwi! It's like a baby kiwi that you can pop in your mouth like a grape! Nutrition: Kiwiberries are a super fruit! Five times the vitamin C of an orange, per serving! 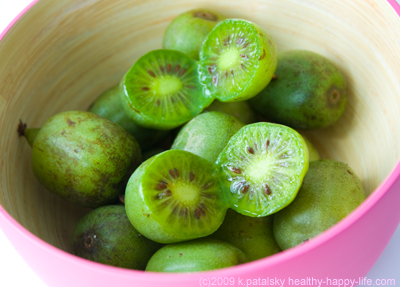 Kiwiberries are high in fiber, vitamin C, vitamin A and calcium! Yum. And you'd better hunt these gems down because there are only around 200 commercial acres farming kiwiberries! "These vines produce a fruit that we call Kiwi Berries - the "no fuzz", "no peel" cousin of the traditional kiwifruit. Sweeter and more flavorful, each variety has its own color, size, and tropical taste. Their smooth skin allows you to pop them into your mouth and eat them like grapes. They are perfect for snacks, a healthy addition to a lunch box, or you can add them to your favorite recipes. Presently, there are less than 200 acres of commercially grown hardy kiwi (A. arguta) on the planet."